(Nanowerk News) If you want to understand how novel phases emerge in correlated materials, including high-temperature superconductivity and nanoscale electronic order, you can obtain completely new viewpoints by taking ‘snapshots’ of underlying rapid electronic interactions. One way to do this is by delivering pulses of extremely short-wavelength UV light to a material and deriving information based on the energy and direction of travel of the emitted electrons. However, generating pulsed extreme-UV (XUV) light with the required properties for such applications is difficult to achieve. Now, researchers at the U.S. Department of Energy (DOE)’s Lawrence Berkeley National Laboratory (Berkeley Lab) have developed a way of producing an efficient, high-repetition-rate XUV source for use in obtaining rapid, sharp images of electronic structure (Nature Communications, "Bright high-repetition-rate source of narrowband extreme-ultraviolet harmonics beyond 22 eV"). Berkeley Lab researchers have developed a way to produce high-repetition-rate XUV light for obtaining rapid, sharp images of a material’s electronic structure. Angle-resolved photoemission spectroscopy, or ARPES, is a key technique that makes use of the photoelectric effect for studying condensed matter materials. By analyzing the emitted electrons, it provides direct information about a material’s electronic structure in energy and momentum space. But standard detectors used for static measurements are about ten trillion times slower than the timescale on which electrons interact with each other. To access such microscopic timescales requires a different measurement technique based on extremely short pulses of light, on the order of 10 to 100 femtoseconds (1 fs is 10-15 s). Importantly, the photon energy of light also needs to overcome the work function of the material – with shorter wavelengths allowing for a more comprehensive view of electronic structure across energy and momentum. Thus, time-resolved ARPES requires overcoming two challenges: generating short-wavelength XUV light, and pulsing it at rapid intervals with a small number of photons per pulse, to minimize blurring from electron-electron interactions that occur after photoemission. The scheme first converts infrared pulses from an amplified femtosecond laser into the UV, then gains back orders-of-magnitude in efficiency through subsequent high-harmonic conversion. At the high rate of 50,000 pulses/second, the correspondingly weak UV-driving pulses have to be focused tightly into the thin column of Krypton gas where high-harmonic generation occurs. However, this intermediate step yields a more than hundred-fold boost of XUV conversion efficiency, compared to driving the process directly with the infrared laser. In a new technique from Berkeley Lab, UV light is used to efficiently generate XUV light at high repetition rates. Narrowband, isolated XUV harmonics around 22 eV are obtained, ideal for time-resolved ARPES studies of materials. The Berkeley Lab study demonstrated an exceptionally bright XUV source flux, with the strongest harmonic line occurring at a wavelength of 56 nm (photon energy ~22 eV) and exceeding 1013 photons/second. 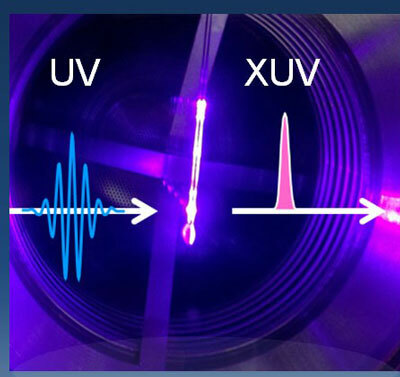 By accompanying these experiments with numerical calculations, Wang and Kaindl explained the observed efficiency boost through a combination of favorable electron dynamics in the intense UV laser field, together with a near-optimal coherent buildup of XUV light across the gas. In addition to flux enhancement, the setup also delivers other benefits. The harmonic has an energy width of 72 meV, corresponding to only 0.3 % of the photon energy. “That is extremely narrow for high harmonics, and allows us to take sharp images of the electronic structure in materials,” Wang says. With this bright, high repetition-rate XUV source, researchers now have the opportunity to gain new insights into the physics of correlated materials by tracking their rapid, fundamental interactions across large swaths of energy and momentum space. Beyond that, these femtosecond XUV pulses represent a powerful tool for other applications such as short-wavelength metrology, coincidence and time-of-flight spectroscopy of molecules, and nanoscale imaging.